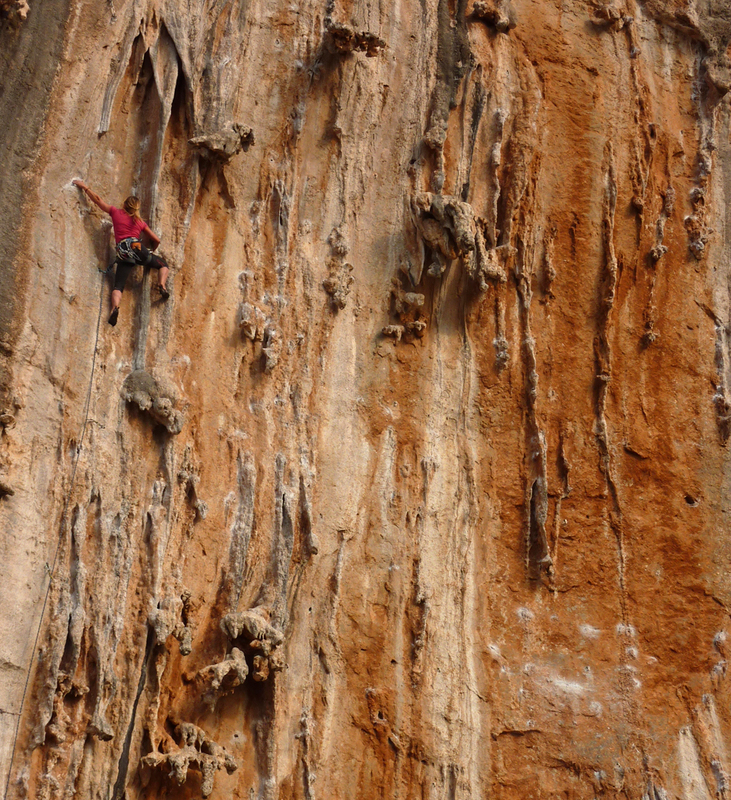 21st Nov 2011 A Greek Odyssey or the busman’s holiday in Kalymnos. Sitting on the top of the Kalymnos “Dolphin” ferry boat wrapped in my belay jacket by way of protection from the nippy northerly I felt strangely reminded of a Scottish island ferry port in the Outer Hebrides or the Shetlands. The boat was after all a local bus dressed up as a tourist service with its rows of blue plastic bolt down seats on the open top. The quay itself was a nasty little concrete out jutting from a deserted street where all the shops were shut and were there to service a currently non existant tourest trade. Maybe it was that the majority of the seemingly potential passengers who were loitering on the bleak concrete quayside were islanders who had been away working in Kos servicing the tourist industry and were returning to their homes for the night. Maybe it was the freight carrying aspect of the boat which was stacked up with fresh fruit and vegetables for the businesses in Kalymnos, or maybe it was that everyone of the locals who were waiting for departure continually chain smoked and shared a bottle of the local vintage. Then at some, to me, unannounced and indeterminable signal there was a final sharp drag on the fags and an almost audible hiss as the butts were simultaneously propelled into the harbour then everyone jumped on board and we were off. 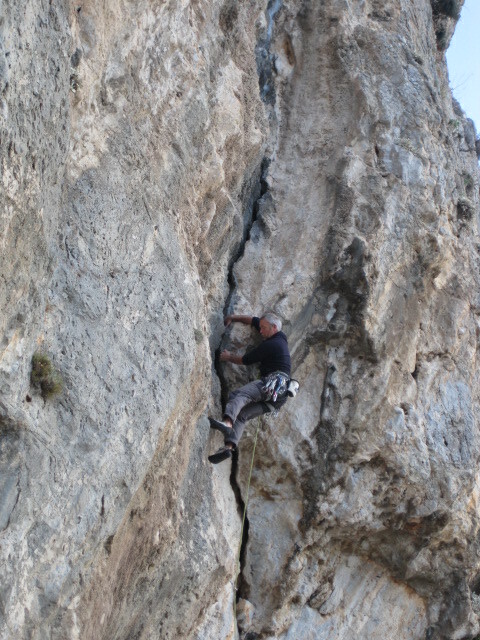 I have, in the past and in general been a Spanish holiday climber, the Costa Blanca, El Chorro etc etc was where we went when the cold winds blew and the dreich conditions commenced. Sure you can always climb in the UK, especially living in the south as we do but I like to feel the sun on my back and not to have a fleece, thermals etc etc impeding my movement, gloves whilst belaying and the hot aches when its your turn to climb (Southern Softie I here my Scottish friends cry). Greece, and in particular the island of Kalymnos, seemed like too much of a hassle to get to when the weather there was clement and the crowds had died down. There was the flight to Kos via Athens ( The direct flights to Kos from the UK stop when the holiday season does ) and the double taxi costs and ferry costs do not make this a really cheap option. However on the other hand I could not continue to ignore the tide of enthusiastic friends waxing lyrical about the scores of three star routes, amenable grades on unpolished rocks just a short walk from your apartment, never ending tuffa’s, good cheap food, endless sunshine etc etc. Was it all true? Well that’s why we found ourselves driving into the Purple parking plot at Eefrow on a murky autumnal evening in November. Terminal one was awash with an impressive array of firepower as our check-in for the Aegean flight to Athens was next to the El Al Tel Aviv check in, however with no queues at our desk we escaped the cyclopic stares of the tooled up Spartans quite quickly and fled to the other side of the departure gate to eat our pre-packed provisions. A 10 hour wait at Athens for our connecting flight was made doubly intolerable by a jobs worth who insisted that we were not allowed to sleep lying down on the seats, OK if you can sleep sitting up, which I can’t, so every time either Jane or I fell asleep and slumped over he was there to wake us up. Come on guys, what are you supposed to do when your connecting flight is 12 hours away and you landed at 0200 ( UK time). Maybe being customer focused is not on the list of things to do when you manage an airport or maybe it was just a ploy to keep us purchasing coffees at 4.80 euros a pop!! (Could be a way of Europe actually baling out the Greek debt crisis through stealth taxation!!). However the smile and victual dispensing sirens who lured me onto the 1 hour flight to Kos re-established my faith in Greek hospitality and a short (5 mile but 16 euro !!!!) taxi ride to the ferry terminal saw us bobbing up and down on the Kalymnos Dolphin awaiting departure to the rugged and rocky island on the northern horizon. The ferry did not look like any dolphin I had ever seen (It looked more like a Trojan horse) but rounding the harbour wall into the sizeable (by my landlubber standards) swell the pilot unleashed the power and we ploughed into the waves at a considerable speed on previously hidden aquafoils. With Aeolus giving us a wind in our faces we powered into the waves creating a big bow spray as the sun slithered slowly into the sea off the starboard side. At dusk we arrived in Pothia, the islands main port jumped a taxi and drove over to our pre-booked accommodation in Masouri. We thought it was pre-booked, turned out it was full up and there was no one there to help us.. Beware all future travellers to Kalymnos, there does not seem to be any booking process that is honourable, it’s first come first served. There was no shortage of other accommodation, but none at the price we had been quoted. With darkness almost upon us and all our kit to carry we were beginning to feel a tad anxious. Cue the almost magical appearance of our friend Ray who we had arranged to meet on the island, along with a squad of other Bristol based climbers. He had sorted something out for us in a neighbouring block of apartments for the couple of days until our “booked” room became free, God bless you mate. Suitably accommodated, we dumped our bags, headed out for something to eat and upon return to our studio crashed into a blanket festooned pit. I would love to report a dreamless slumber but alas and alack the room was heavily impregnated with marauding mosquitoes that commenced their dive-bombing the moment darkness ensued. I just could not be bothered to go on a killing frenzy so my sheet became a tent, my pillow the tent pole and unconsciousness ruled supreme. The next few days established our holiday routine, up at a leisurely hour, breakfast, coffee and a walk up to the local crag for a day’s entertainment. Then at beer’o’clock (dusk) down to the taciturn Geordie’s bar in Masouri for a Mythos (the local brew), after which a shower, out to one of the local restaurants for food, back to the apartment, conduct an ethnic cleansing on the mosquito population in the room with a handy Brecon Beacons map, sleep, then start all over again. The first four days flew by with visits to sectors Iliada, Odyssey, Poets and Arhi, the weather was kind enough to allow us the comfort of shorts and t-shirts whilst climbing in the sun but was not hot enough to make the 5-10’s intolerable after a couple of hours wear. Day five dawned cold and wet, however undaunted we headed up to Grande Grotta which is undoubtedly one of the most impressive limestone cave features I have seen to date. Big enough to keep even the worst of the windblown rain away, festooned with tuffas of all shapes and sizes and steep enough to give you belayers neck after one route. 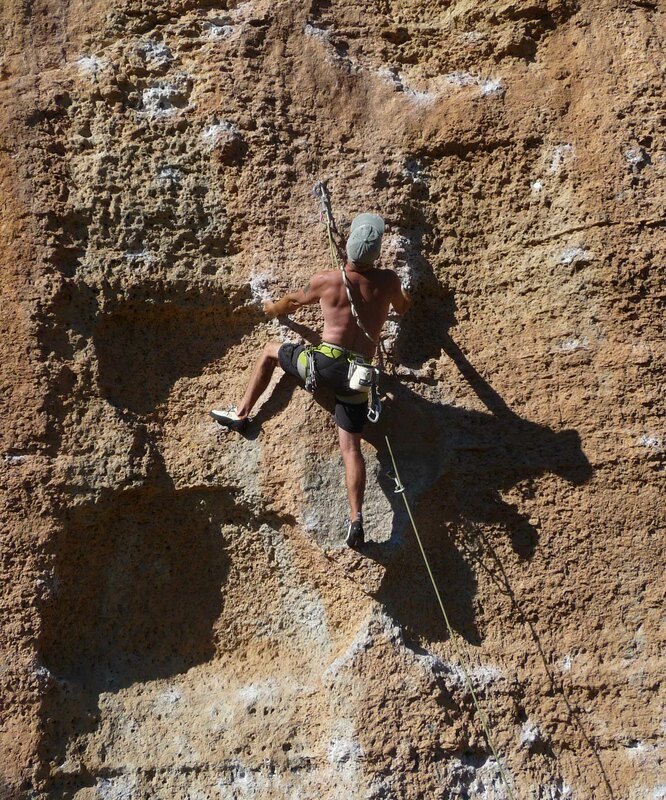 The only downsides being the need for shoulders like Achilles to cope with the strenuous nature of the climbing and the issue that every other climber on the island was there that day. Day six was again wet, cold and windy so we opted for a day of rest and recuperation, there were still after all another five climbing days to go. So now I sit here back in my office looking out at a warm wet Monday with concrete coloured skies wondering why I didn’t make it a month long trip. The last week of our stay just flew away, after the enforced rainy rest day the rest of the week was sunny but with a northerly wind that had us seeking out the crags with the best southerly aspect. The island itself was slowly closing down for the winter, battening down the hatches and going into hibernation. Restauranats we were in one night would be closed up the next, even the hole in the wall cash machine closed one day ( throwing me a complete wobbly ) There was a sense of contentment as the islanders knew they once again had their little bit of paradise to themselves again ( with the exception of a few dozen nutcase climbers that is) That week we had return trips to Iliada and Arhi but also investigated Ghost Kitchen ( Amazing Tuffa features ) Firewall and Monastry crags. 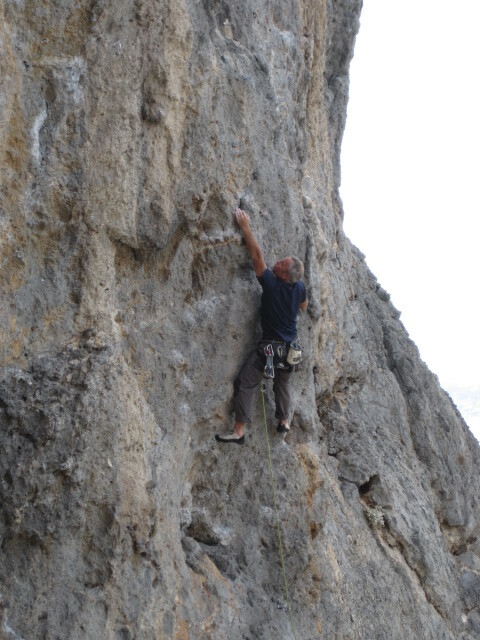 Was it all as good as everyone had said it was going to be, undoubtedly, the climbing is superb with steep slabs, Tuffas, pocketed steep walls on so many sectors it would take you a month just to visit them all never mind climb them out. The rock is generally superb, sometimes a little bit sharp of the slabs and the water pockets, only one of the crags we visited ( Odessey) was in any way suffering from polish. 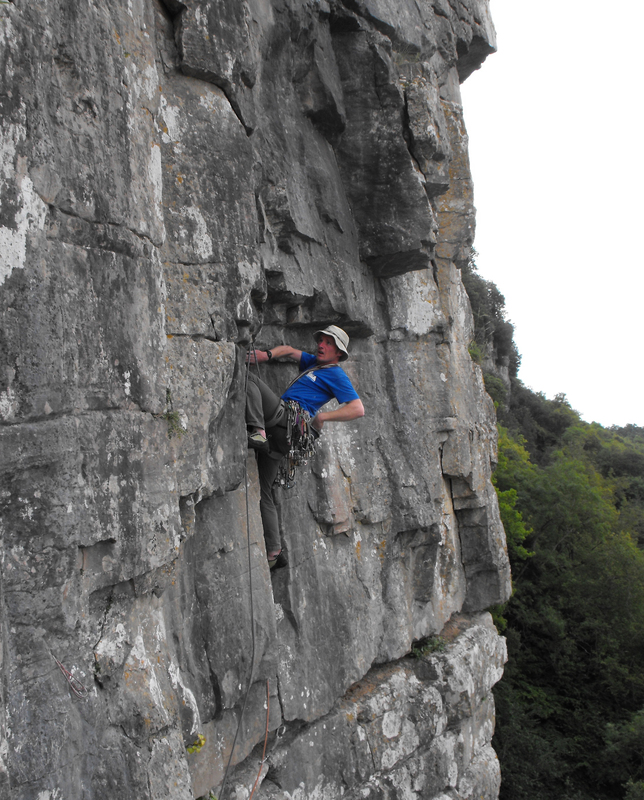 The grades are a little bit wonky in places with 7a’s on some crags that I had a chance of onsighting and 6b+’s on others that would sometimes spit you out like an olive stone. There are enough routes in all the grades to satisfy the 5/6a climber, the mid 6 to low 7 grade climber and the 7a+ to 8c rock athletes. The accommodation is not set up for self catering and it is not a really cheap option to eat out all the time, also the food in the restaurants is a bit heavy. However the people on the island more than make up for any of these little complaints. Three times Jane and I set out to walk the 5 miles from a crag back to our apartment and everytime we were offered a lift within a few hundred meters of starting our walk. Katarina who owned our apartment baked us cakes and made us sandwiches, boiled eggs and a packed lunch every day for only 7 euros a night p/person ( inc accommodation which was spotless ). I am one of the converted, who’s up for a trip to Greece ? Throw a frog into a pot of hot water and it will jump out pdq, however put a frog into a pot of cold water and then gently heat it and the frog will remain there until it boils ( allegedly), not a pretty picture I grant you. Ladakh this year, record high temperatures, Snowdonia in Oct ( see below) Spain two weeks ago…. The ferry had been booked for 0400, I must have been off my head, up at 1200 midnight onto the road at 0100 out of the ferry in the dark and the rain into Dunkirk, access road to the motorway closed, no diversion signposted aghhhhhhhhhhh. Get past Lille and stop for a sleep three hours later back on the road…Troyes, Lyon past in an 80mph blur, good clear roads took us to Perpignon and the worst motorway meal I have ever had in my life ( Might have been roadkill, do the French do that ?) into Spain for Nightfall… Barcelona, Reus into the mountains, tent up zzzzzzzzzzzzzzzzzzz. 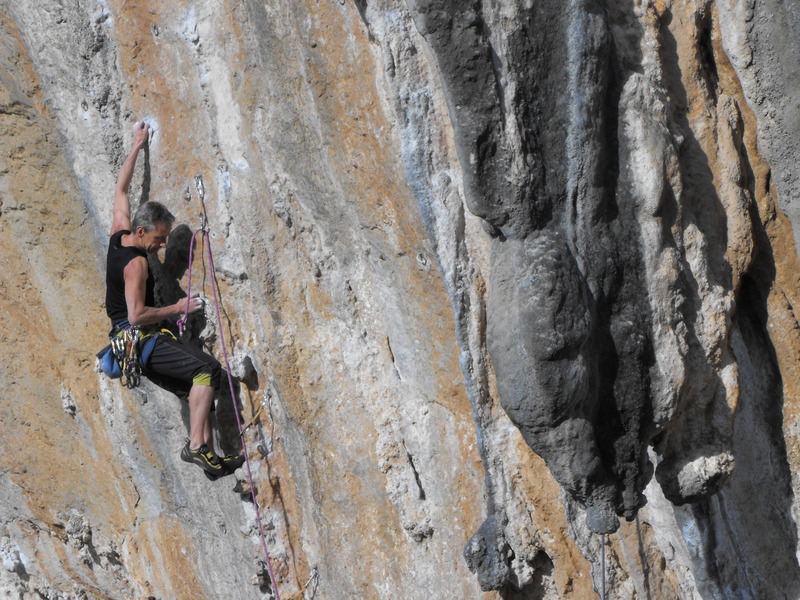 Next day we went back up to Barcelona to pick up Dunc and Baz our climbing guests for a week long trip to show off the delights of the Costa Duarada. The temperatures had been climbing steadily as we made our way down through France and into Spain but the first morning in the Duarada dawned overcast with a cold wind which had kept us awake for most of the night. 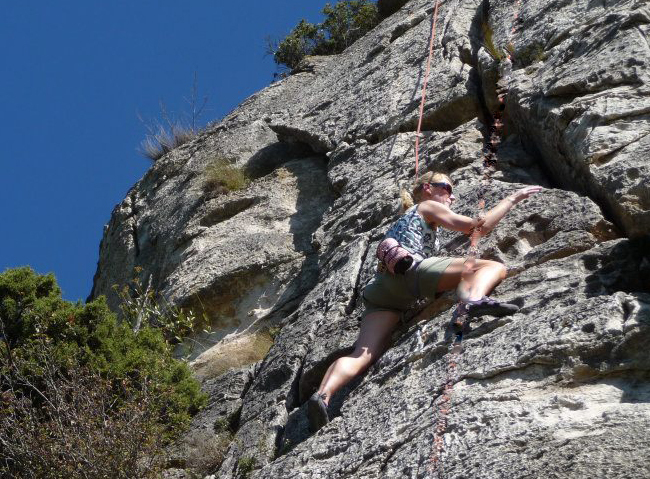 However not be put off by a coolish wind we headed out to Arboli and climbed 9 routes over 6 hours mainly to keep ourselves warm in the cool wind. By beer o’clock it was back to the refugio for pasta and chorizo. Lessons learnt from the previous evening we suited up before climbing into our sleeping bags and spent a generally more comfortable night. Next day we rose to no wind and no cloud cover, still felt cool so we headed down to La Sotterani cliffs which I knew to be sheltered and a bit of a sun trap. Wrong decision, by 1100 the temp was reaching 30 degrees and by 1500 we were just worn out after only 3 routes in the by now 35 degree space at the bottom of the cliffs. We did however manage to get onto Elgocentrix, which in my humble opinion is one of the best 6a+’s in the Costa D if not the universe. Definitely cold beer o’clock by now. Taking it easy we had the next day off and decided to walk from Siurana to Prades, well we tried. After three hours we gave up due to the heat and set a shortened return route back to the car. So instead we drove to Prades, which is a lovely medieval town in the heart of the national park for some cold beer.. See a pattern developing here ? 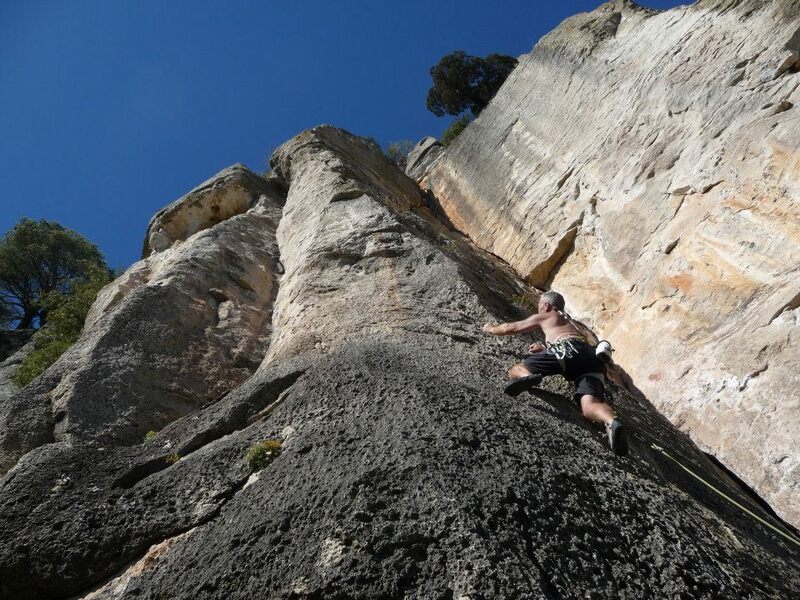 After this we set a routine of rising early and getting onto the rock before the heat started, we climbed at Siurana, Mont Ral and then again at Siurana. Despite the temperatures we did some excellent routes, maybe not at the grades we had hoped for but it was a great week in the sun. However back to the boiled frog, apparently it was the hottest ever recorded temperature in Oct in this region of Spain. Are we now just like the frog sitting in the steadily heating pot of water, will we one day wake up and realise that the climate has been steadily changing and that it is now too late. Or will the people who believe that mankind will be able to sort this all out before the pot boils be proven right ? I hope so but as James Lovelock puts it the human race is like a person sitting in their living room watching the telly whilst their kitchen is on fire with the attitude ” Yes I know about it but I dont want to be told about it” Denial seems to be an inherent attitude to the state of the planet, but then I am just depressing am I not. Baz and Dunc headed off back to the UK and we were then joined by the pupils from Ibstock place school in London for a Gold DofE ( Read about it here ) after which we headed back to the UK. Back to the frost and the promise of DofE in Wales next week, bring it on. 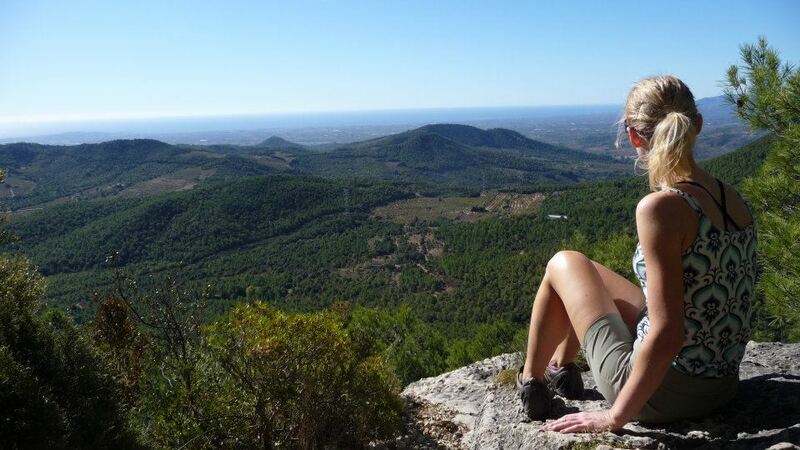 We are going to Spain on Thursday for two weeks climbing and walking in the sun. We should have been spending the weekend getting ready, packing, sorting kit, shopping etc etc. There is also the garden to sort out, its overgrown, fruit trees needing harvested, grass needing cut blah, blah, blah blah blah. However on Tuesday just passed Jane got the all clear from the hospital 7 months after breaking her back and neck in 11 places. The last 2 months had been incredibly frustrating for her as she felt strong and healthy but did not want to prejudice her recovery by pushing it too far too fast. The forecast from Wed onwards was unbelievable, 28 degrees in the south, too hot to do all those jobs in the garden anyway and too nice to stay indoors, we needed somewhere a little cooler and something to ease Jane back onto the rock prior to the Spanish trip. A blackbird was singing in its native Welsh tongue, proclaiming all to be at peace in the world as we arrived at the CC hut in Llanberis. I could do nothing but heartily agree with it, a bit breezy, but at 7.00 in the evening a balmy 22 degrees was not to be complained about. 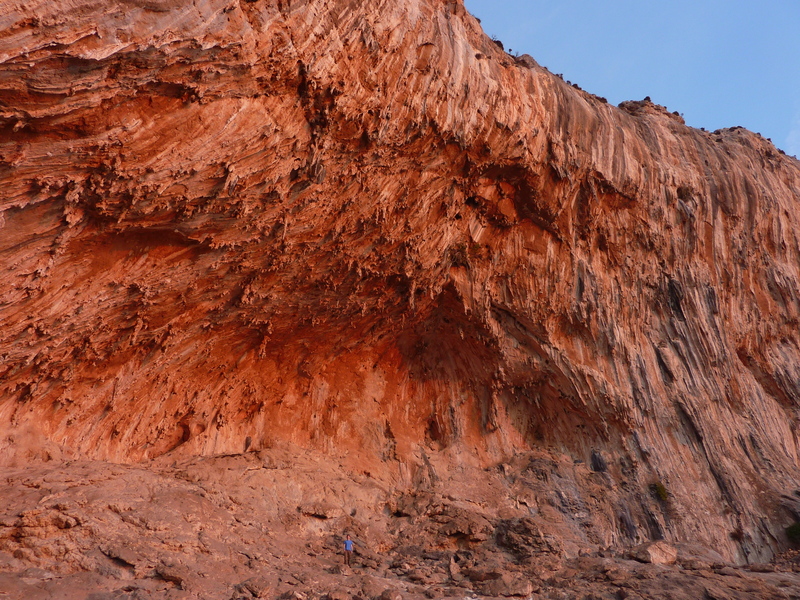 Next morning we headed into the Idwall slabs, seemed like the perfect place to start the rehabilitation process and a five pitch severe called “tennis shoe” was chosen for the purpose. 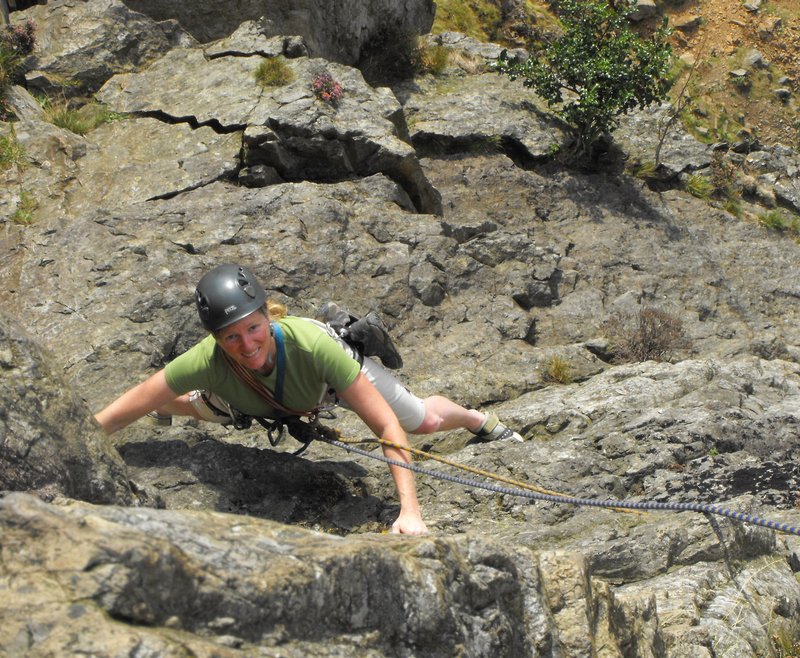 Any fears we had about lack of confidence, loss of ability etc were quickly dispelled as Jane shot up the route completing the five pitches and retreat back to the ground via the rotten gully descent in just under two and a half hours. The slabs had been an excellent choice, shady ( from the sun ) and sheltered from the wind we decided to call it a day at that and headed into Llanberis to worship the gods of retail excess in the emporiums of climbing kit. Friday morning broke with the promise of another fine day so rather than drive anywhere we walked across the road and onto Carreg Wasted. 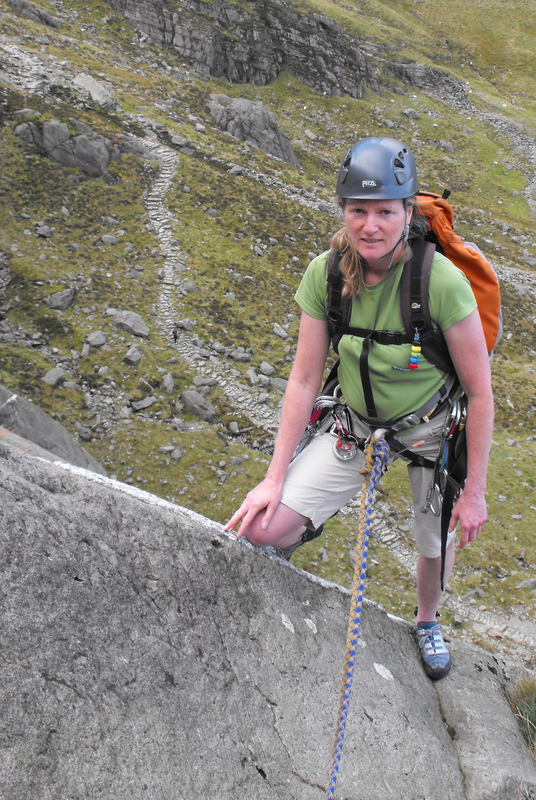 Jane made short work of Crackstone Rib another multi pitch severe, slightly steeper that the slabs and suitably encouraged we decided to up the grade a little and see how we fared on one of the classic welsh VS’s, “Shadow Wall”. 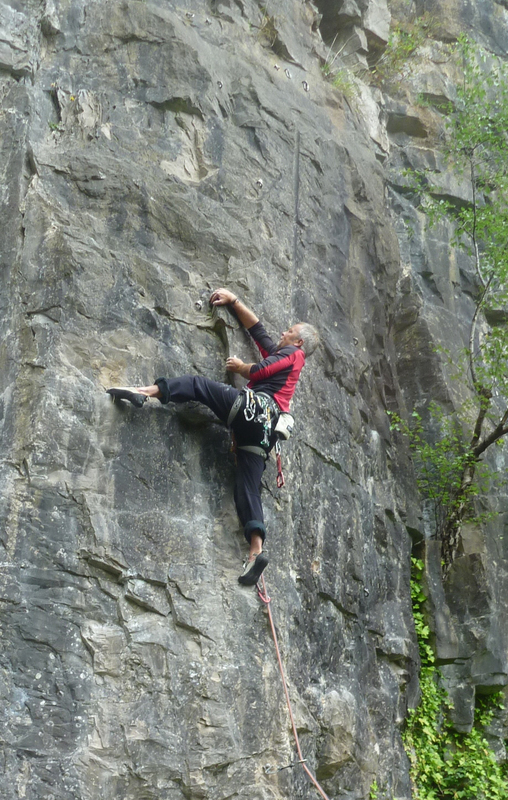 A scrappy first pitch leads onto a traverse of escalating difficulty on ledges under a big overhanging roof, a great route at the grade, totally recommended, great gear, great positions and really exciting. It was still only half past one, too early to stop but again not wanting to push too hard we settled for another classic VS called “Lion”. By the time we had dispatched the four pitches it was four ( beer) o clock and/as my feet were screaming after six hours of being crammed into rock shoes in 25 degrees. Sat dawned a tad overcastish but with the promise of clearing later on ( my feet still felt brutalised by the 5.10’s ) we opted for a walk. Where was it to be ? A saturday on a sunny day in Snowdonia. Like most mountaineers I dislike sharing the hills, my selfishness is far from unique but lets face it if we wanted to be one of the hordes we would go to the beach or Macdonalds. I, like most of my breed, go to the hills to find a bit of peace and quiet and cleanse my soul. the idea of tramping up Snowdon with the charity enthused hordes in their uniform teeshirts does not appeal. Maybe I am a snob but hey ho. However just to the west of Snowdon, Moel Eilio and its circular ridge seemed like just the right choice. Starting in Llanberis we walked up through the woods, crossed the railway track and entered the access land just to the north of the steep and steady approach to the summit. Two buzzards seemed to be challenging our right to roam as they noisily disapproved of our presence on the ridge ( maybe they have not heard of the Crow act! ). They were the only ones, we had the hills to ourselves. Lunchtime saw us sheltering from the brisk but welcome breeze in the considerable summit construction then post prandial walking took us onto Foel Gron and then Foel Goch before crossing the telegraph path and climbing to our final summit of Moel Cynghorion. From there we dropped down to the Snowdon ranger path but only to then traverse around into Cloggy and gain a quiet seat in the sun to watch the climbers fretting their way up some scary looking stuff. From there we made our only mistake of the day, we walked up to join the main tourist path down into Llanberis. Litter, dog crap etc basically the sewerage of “civilisation” and what pleasure the mountain bikers were gaining from haring down the path in-between the walkers, hobblers, wobblers and limpers I cannot fathom out. I love my bike but do not wish to maim myself and anyone else into the bargain by pursuing one of my other passions. All this and the Vauxhall Frontera once again parked on the top of Snowdon ! Seems like the guy who drove it up there the last time has done it again, Reason being it was one of the 100 things he had to do before he died, must have been 21 and 22 then !! I really hope they throw the book at this clod and set a real precedent before his actions set one. When we were is Snowdonia in July it snowed, now in Oct I could not sleep in a sleeping bag, it was too hot, apparently the hottest October day ever recorded in Wales. Sun morning dawned dreich so we headed back south, a great three days however and Jane well psyched for our trip to Spain. Suppose I better start packing ! I thought I was due to fly to Delhi on Sat, but when I checked my flight itinerary on Thursday i found out my flight was on Monday ! I had two extra days at home, I felt like a little boy in a sweetie shop, two extra days to spend. My fingers were quicker than Robert Maxwells denials as I texted around and at short notice Simon and Simon, yes there are two of them, answered the call for a stress free day at Portland. An early start saw us in climbers and walkers car park by 9.30 and then onto our first route by 10.15. Go with the flow a nice little warm up did its job and we traversed around to find some steeper rock to play on. “Burning Skies”, given 6C in my guide book, which is old and is the one I am going with, proved a nice little test piece to get out muscles pumping and our brains focussed. 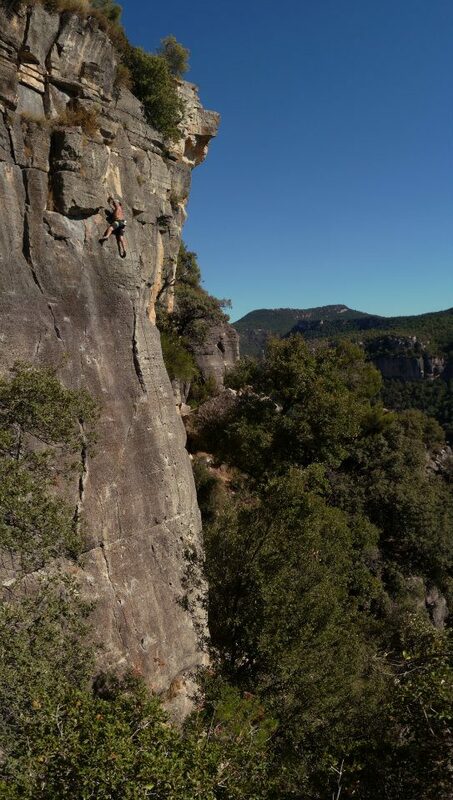 From there it was around the corner and onto “Return to Roissy”a nice little 6B+ which is steady away till you get to the top and are greeted with a pretty much blank wall devoid of anything decent in the way of holds. The lower offs remain tantalisingly just out of reach untill you have balanced, sweated and teetered your way up to them. The challenge of the day was then set on “The last rose of Summer ” a 7A on a big blank wall. Great route for crimpers and right up my street. Quite low in the grade but fantastic value none the less. From there onto “Talk” a nice little 6A wind down which was just right for my tortured arms and fingers. Home for Sunday dinner and time to enjoy the comforts of home before my postponed date at Heathrow for the Kingfisher flight to Delhi. Met up with Henry, the head instructor at Bristol climbing wall and his friend Alex at 0930 on Wednesday morning and after a much needed coffee we headed off to Wintours Leap in the Wye valley. Liquid sunshine was in evidence when we arrived so we found a face in Woodcroft Quarry which was sheltered by an overhanging tree which at least kept the rock dry if not the belayer. Henry wasted no time ( surprise) in getting onto “The Fire Escape” E2 5B which provided a good warm up for all of us. A bit of a soft touch for the grade and is probably more an E1 as the holds and the gear are good. Not having complete faith in the friction ( A bit greasy) I opted for the bolted route to the right of this which was not in the guide book. First attempt was pretty dismal and i was off after the second clip. However the third attempt proved positive and on improving holds made the lower off. Probably 6C+/7A strong fingers required. Henry then turned his attention to “Raison d’Etre ” a crack line with some fabulous looking flowstone and some really dubious looking flakes which led to an imposing roof. Curses mingled with occasional pleas for salvation and not imminent injury/death saw Henry established on the top then it was my turn as alex had decided that discretion was definitely the better option than valour. This may have been on account of his having to dodge the rather large stones that Henry dislodged on the way up. This was one scary route, dubious pegs, dirty holds, loose rock and a really thuggy finish conspired to make this great looking line not a route that I would recommend to anyone who does not harbour a death wish for themselves or their belayer. 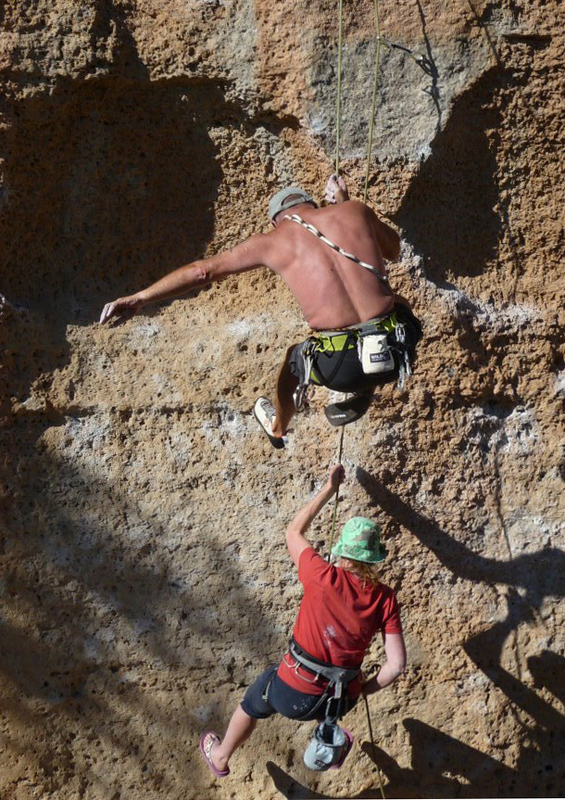 With the sun, and my shorts, coming out we headed onto the main Fly Wall to have a bash at the original, and still one of the best, routes of the wall. Firefly E2 5C is no soft touch for the grade. 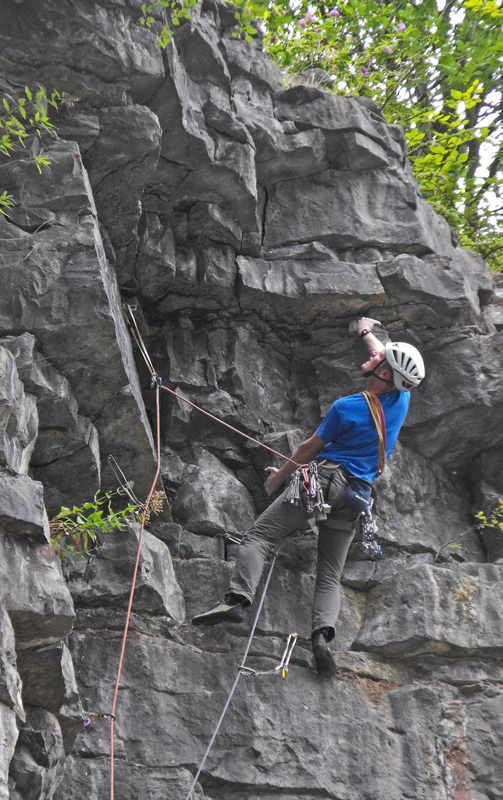 After I had us established on the belay ledge under the 2nd pitch Henry launched himself into the sustained and difficult series of moves. From my viewpoint on the belay ledge, which was heartily decorated with the lunch, breakfast and dinner remnants of what would appear to be a ravished ( but now sated) host of peregrine falcons. 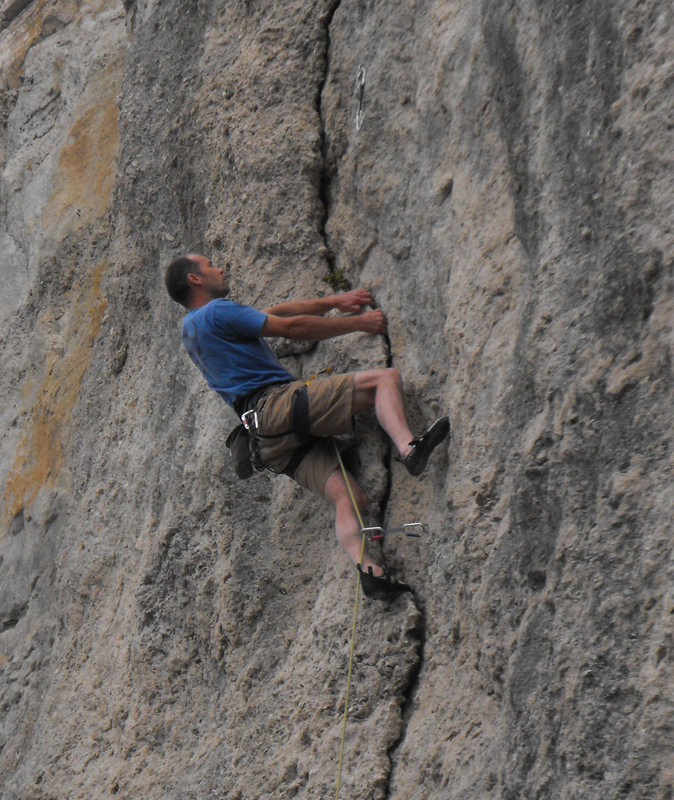 I watched as Henry made relatively short work of the crux and then the finishing wall. nice one matey. Four, good ?, routes accomplished we called it a day and headed back to Bristol.